A 1954 Ferrari 375-Plus sold for over $18 million as the most-expensive car sold thus far this year at public auction and most-expensive Ferrari racing car ever. The 2014 Bonhams Goodwood Festival of Speed for the second year running saw the highest price paid for a car at public auction thus far in the year. A 1954 Ferrari 375-Plus achieved £10,753,500 ($18,309,613) – the highest price ever paid for a racing Ferrari at public auction and the most-expensive car sold thus far in 2014 at public auction. It was the highest price paid for a car since the world record $29,650,095 (£19,601,500) was set at the 2013 Bonhams Goodwood Festival of Speed for the 1954 Mercedes Benz W196R Formula 1 racer. 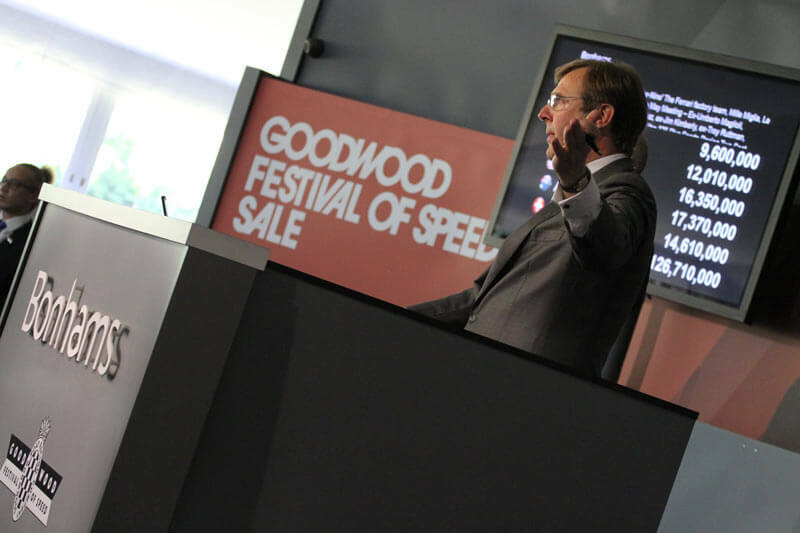 High results are usually achieved at the Bonhams’ Chichester Goodwood Festival of Speed auctions and 2014 was no exception. Seven cars sold for more than a million dollars each while several further similarly high bids were not sufficient to clear the reserves. The 2014 auction grossed £22.6 million. A 1954 Ferrari 4.9-litre 375-Plus Sports-Racing Two-Seat Spider Competizione sold for £10,753,500 ($18,309,613) at the 2014 Bonhams Festival of Speed Auction as the most-expensive racing Ferrari ever sold at public auction. The 1954 Ferrari 4.9-litre 375-Plus Sports-Racing Two-Seat Spider Competizione with coachwork by Carrozzeria Pinin Farina (Chassis no 0384, engine no. 0384) naturally comes with an impressive history. It is one of only five specially built as Ferrari factory entries to racing competitions in 1954. The V12 4.9 liter engines were Ferrari’s answer to the new V8 engines introduced by Mercedes Benz and Lancia for the 1954-racing season. Reputably heavy on brakes and hard to drive, the press dubbed it “Le Monstre” or “The Fearsome Four-Nine”. This particular 1954 Ferrari 4.9-litre 375-Plus Sports-Racing Two-Seat Spider Competizione won Silverstone sports car race in 1954 driven by José Froilán González and participated the same year as a works entry in the Mille Miglia and Le Mans (won by a sister car). As a private entry with Ferrari support, it participated in the 1954 Carrera Panamericana in Mexico (won by a sister car) and in 1955 in several races after being bought by Jim Kimberly. 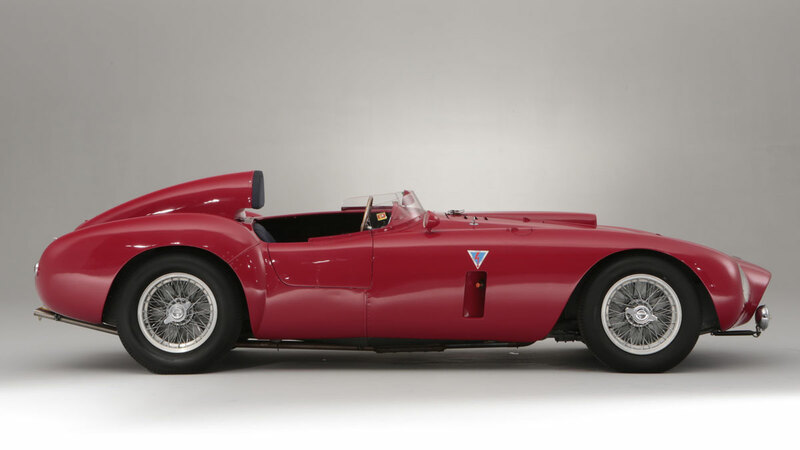 The previous record for the most-expensive Ferrari racing car ever sold at public auction was for the 1957 Ferrari 250 Testa Rossa, which sold for $16,390,000 at the 2011 Gooding & Co Pebble Beach auction. Even If prices are adjusted to current values, the 1954 375-Plus sold for well over a million dollar more than this Testa Rossa.) The 1967 Ferrari 275 GTB/4*S N.A.R.T Spider that achieved $27,500,000 at the 2013 RM Auction’s Monterey sale is still the most-expensive Ferrari ever sold at public auction. Of the other top results achieved at the 2014 Bonhams Goodwood Festival of Speed auction, the 1902 De Dietrich 16-hp “Paris-Vienna” Rear-Entrance Tonneau is probably the most interesting. Despite being over a century old, this car has had only four owners since new. It was built to the same specifications as the work entries for the 1902 Paris to Vienna race – already back then success in motorsport was seen as an important marketing tool. The vintage De Dietrich sold for $1.7 million. Also attracting keen interest was a 1975 Lamborghini Countach LP400 Persiscopio Coupé that sold for $1,6 million – a new model record for this iconic super-car from the late 20th century. This Countach is a rare right-hand drive example and has covered only 12,500 km since new. In contrast, a 1983 Lamborghini Countach LP500S failed to clear the $200,000 mark. Earlier in June, Bonhams sold a similar 1975 Countach LP400 for $1,210,000 at the Greenwich Concours d’Elegance auction. Of the number of racing cars on sale, the 1968-69 Lotus-Cosworth Ford Type 49B Formula 1 and Tasman racing single seater was the only car other than the top-selling Ferrari to have breached the million dollar mark. This car, which totally revolutionized Formula 1 design, was driven by Graham Hill amongst others and is one of only five that survived.